With today’s busy, digital lifestyle USB flash drives are a necessity. I find myself constantly shuttling information between home and work. At each location, my data is transferred from one computer to the next. To be sure, there are more elegant, sophisticated solutions: Bluetooth, Ethernet, and WiFi networks come readily to mind. But for quick and easy, with no setup involved, it’s hard to beat the good ol’ “sneakernet.” This term was originally used for moving files from one machine to another using floppy discs (and Nike’s). USB flash drives have pretty much replaced floppy discs as well as the larger Zip discs for almost all users, due to their larger capacity, diminutive size, and affordable cost. In fact, 7.6 million of these units were sold in 2004, and even more growth is expected over the next few years. See where USB flash drives fit into the world of flash memory here. This package can be yours for a mere $59 retail! Look around, these drives are often sold for less after rebate. 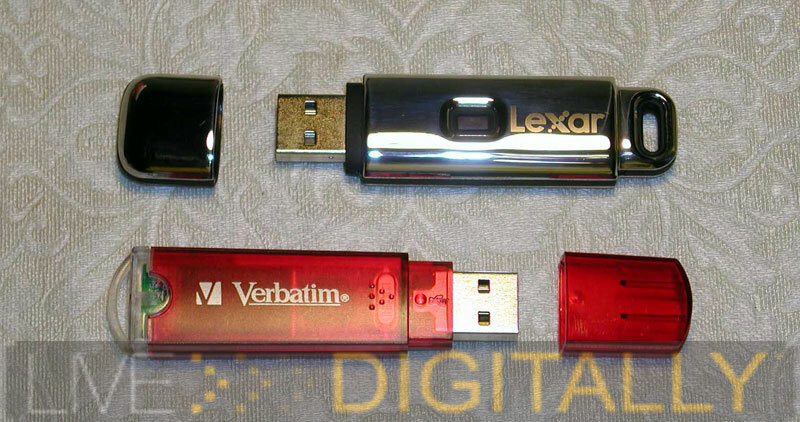 The Verbatim flash drive is typical of the standard USB 2.0 flash drives out there today. The drive itself is a red translucent color, with a clear plastic loop for the lanyard or to attach to a key ring. Personally, I keep mine on the key ring, and I find the loop a little thin for this. I would feel more secure if the plastic loop was heavier and thicker, but over months it did get the job done with no real sign of wear. The cap sports the same plastic, and snaps definitively on the body of the device. However, there is no mechanism to secure the cap to the drive when removed. Also, there is no clip on the device to help keep it in a breast pocket. Overall, its design reminds me of a Swiss Army knife; it is utilitarian, accessible, and for everyone. The body is designed with a slim profile to fit into stacked USB ports. When inserted, the drive has a green LED which lights up with a slow blink when reading, and a fast blink when writing. This way you know when the drive is in writing mode, so you don’t remove it too soon and lose data. I personally think a red LED would have looked sharper, but green does get the job accomplished. The drive lacks a write protect tab that some other drives in this category have. The drive can be attached to the lanyard. I’m not sure how many adults outside of spy movies want to wear this as a necklace, but maybe some teens and children will use this feature. The stickers for labeling the drive are a good idea for users or households with more than one drive to keep their data organized. These are two nice extras that help distinguish the product in a very crowded marketplace. When connected to a Windows ME, XP, or 2000 computer, the USB drive needs no drivers and is recognized as a USB storage class device. This is the same way many digital cameras and mp3 players are attached to computers. This means that there is no driver required, as it is built into the operating system, and you only need to use the supplied miniCD for older versions of Windows (98 and 98 SE), Linux, and Apple operating systems. While these drivers are usually available on the manufacturer’s website, it’s nice to have it on a disc. It saves time having to look for it, and you never know when your computer will crash and need the drivers at a time when your internet connection is not working. Also on the disc is a useful password utility to protect the data on the drive. This is a simple program and is not as robust as some other included software packages in these types of devices. The USB drive can be configured so that there are public and private (password protected) areas, and the amount of memory in each is user selectable. Shuttling around sensitive data demands this type of protection. The accompanying manual warns that if you forget the 8 digit password, than you will have to reformat the drive and lose the data in order to use the drive again. If Dan Brown writes The Davinci Code 2: Leonardo’s Revenge, this could be one of the puzzles; at least it should keep nosy coworkers out of your files in the meantime. Let’s see how the drive performs in the real world. After all, the first thing I look at in “Car and Driver” is the 0 to 60 mph times (just before I check how many cup holders the vehicle has). For comparison purposes, I have the times for a USB 1.1 flash drive (Lexar 64 mb). The test system is a Shuttle SN41G2 (Athlon XP 2800+), with a dedicated (no hub or other devices) USB 2.0 port and all applications closed. I used HD Tach 3.0.1.0It is a freeware hard drive benchmarking app to measure these times, which is really intended for hard drive benchmarking, but works for this as well. Formatted, the 512 mb drive transforms into 499 mb of usable space. The data shows that the USB 2.0 drive is consistently four times faster at reading data from the drive than the older USB 1.1. This does not take a penalty on processing power, as the CPU utilization is the same. Note that while USB 2.0 is supposed to enable data transfer at 48 megabytes per second and USB 1.1 only provides 1.2 megabytes per second you can see above that the Lexar 1.1 drive approaches its theoretical maximum, but the Verbatim is only 10% of it. The rate limiting component is accessing the data on the flash memory. Therefore, just because the drive is USB 2.0 don’t expect the drive to function at 48 MB/sec. However, to put this into another perspective, is the drive performs at the equivalent to 28.6x for a CD drive read speed (1x = 150 kb/sec). Write performance was significantly slower. I was able to write 67 mp3 files (216.3 mb) onto the drive in 5 min, 36 secs (0.64 mb/sec, 4.3X). This is roughly 40 mb/min; my external hard drive (Western Digital, 120 GB, USB 2.0) is rougly a gig per minute at the same task. I got similar results across 2 different computers. 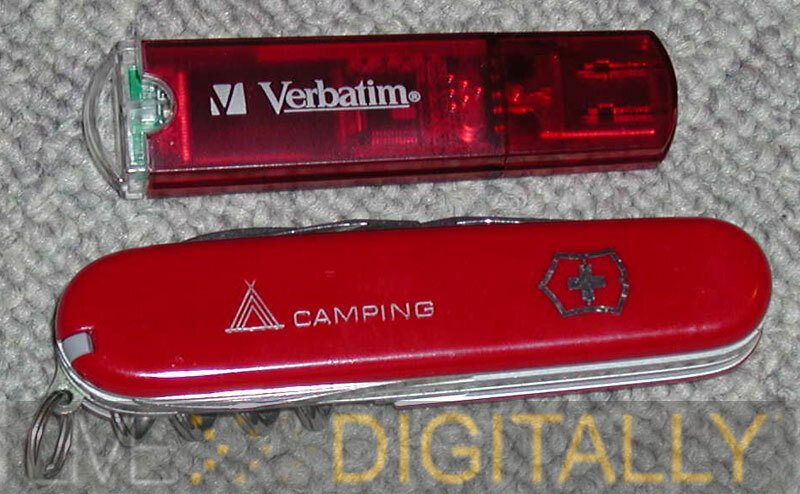 A USB 2.0 flash drive, such as the Verbatim, is a definite improvement over the pokey 1.1 first generation drives, but more so in reading than writing. Overall, I like this drive, but the reading performance is significantly faster than the writing performance. The slow write speed keeps me from giving it the “LD Approved” rating, but it is a good value despite the unsophisticated included software. The form factor is great, and the included extras make this drive a better value than some competitors who sell just the bare drive. 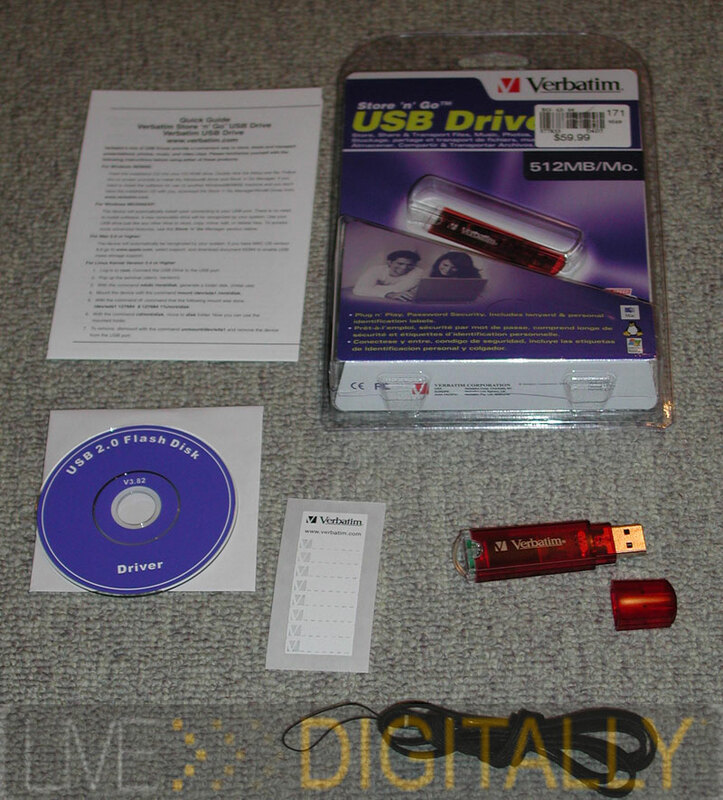 Who should buy the Verbatim Store ‘n’ Go flash drive? This drive is best suited for the budget conscious that needs a large capacity USB drive at an affordable price point. The user will need patience, and can wait a little extra time for it to write the data at its slow write speed. 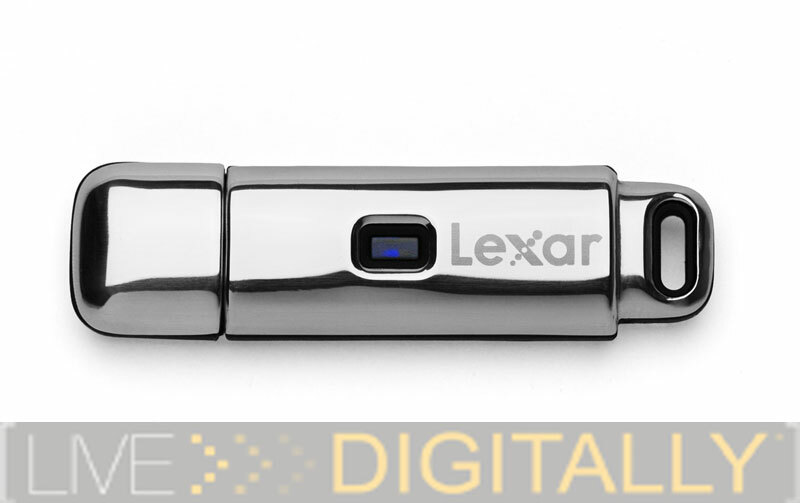 The latest offering from Lexar is the JumpDrive Lightning. It retails in both a huge 1 GB capacity, and an even larger 2 GB size. In the “Costco ‘Large Family’ Size” capacity of 2 GB, I believe it is the largest USB flash drive on the market today. However, while its capacity is stellar, the best reasons to buy it are its design, its speed, and its software bundle. Let me explain how the $275 price tag can be justified. 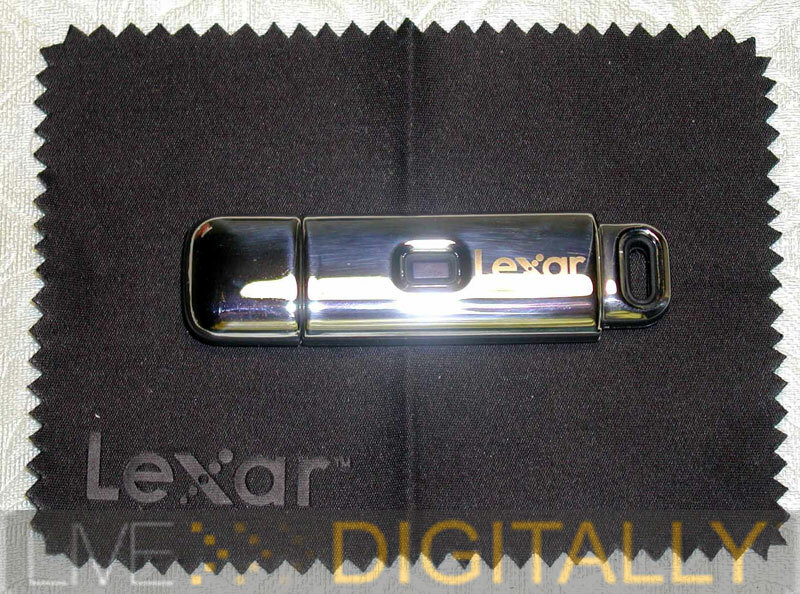 After using the Verbatim drive, as well as competing products, the design that went into the Lexar JumpDrive Lightning is immediately obvious. The drive itself is constructed out of a stainless steel body which is polished to a chrome shine. It is sandwiched onto a piece of black plastic. While not heavy, it has a substantial and solid feel to it, similar to a finely made writing instrument such as Mont Blanc. Whereas the Verbatim is for everyone, this Lexar is exclusive, for those who appreciate the finer things in life. The Lexar logo is tastefully and subtly laser etched onto the body of the drive. The loop is constructed out of the steel and a unified part of the drive. This drive is never coming off of your keychain unless you want it to! The cap snugly fits onto the drive with a muted click. It reminds me of the door of a Mercedes being closed, only about three octaves higher. The drive has a blue LED, which is recessed into the body to avoid scratches. The underside of the unit is designed to be engraved (at your local jeweler, or included if you purchase directly from Lexar) for a personal touch as a gift. The size is suitable to fit into crowded USB ports, but like the Verbatim lacks a cap tether, a write protect switch, or a pocket clip. Quite frankly, the Museum of Modern Art smooth design makes me miss these features less in the Lexar JumpDrive Lightning than in other drives. Included in the package are the drive, an installation guide, and a cleaning cloth. The software is preloaded onto the drive. The cleaning cloth is optical quality (such as what comes with binoculars), black, and has the Lexar logo in a slightly different color of black on it. The way the chrome shows fingerprints, the cleaning cloth is a useful addition to the package. Formatted, the 2 GB drive has a capacity of 1.93 GB. This was strictly hard drive territory less than ten years ago, and more than large enough to tote around a large chunk of files on the road. I’ve seen folks with several of the flash drives, one on the keychain, one in the pocket, one in the notebook bag, etc., and constantly confused where the file they were looking for was (yes, even I’ve been one of these folks on occasion). With the Lexar JumpDrive and this palacial capacity, you can keep your files all in one place which is a real productivity booster, and confusion saver. Unlike others, this drive can be your only drive. The JumpDrive is inserted into a USB port, and the included software launches and loads onto the computer. An icon is placed into the windows tray. The software is as polished as the outside of the drive, a real standout from competitor’s offerings. Uniquely, the drive comes up with the hard drives under “My Computer” and not with the removable storage drives. As with the Verbatim, the Lexar unit can be formatted into public and private areas with a variable split. The private area remains hidden from view until the password is entered to protect your data. 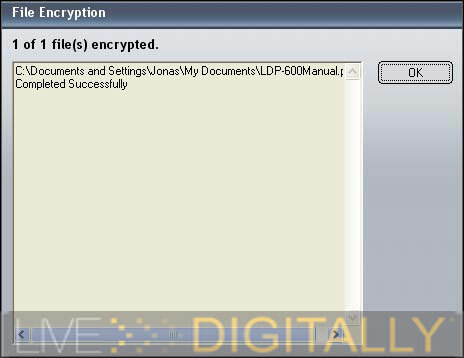 If this is not secure enough for you, a file encryption utility is included that features 256 bit technology. That should keep your data safe from all your friends- even those that work at the National Security Agency as cryptographers! While the above software package is notable, the real stand out item is the file synchronization feature. This is the first time I am seeing something like this, and it is great. Lexar should consider selling it separately; it so essential once you get it set up for users that work between multiple computers. Users can choose to select folder(s) on multiple PC’s that they wish to keep on the drive. Every time the drive connects to the computer, it automatically updates itself to the contents of the selected folders. Filters can be applied for the types of files to be updated, such as only music files, or no help files for example. With many folks using a computer at work, at home, and a notebook, keeping track of the files can be a real chore. This synchronization feature works very well at keeping the files up to date between the multiple PC’s. In my opinion, this is the “killer app” of the Lexar JumpDrive Lightning. The other standout feature of the drive is the speed. They don’t call this drive “Lightning” for nothing. The drive claims to be the fastest USB flash drive on the market today, and states that it can read at 24 MB/s (160x), and write at 18 MB/s (120x). The key behind this is Lexar’s proprietary “Flash controller technology.” I was rather skeptical of these types of speeds as this is strictly hard drive territory, and a fast one at that. My external hard drive from Western Digital across a USB connection is not even this fast, but my internal is in this neighborhood of these speeds. So, I fired up the HD Tach 3.0.1.0 and for some reason it would not test the write speed. What I did find out was that the Lexar drive was able to read at a stellar 16.4 MB/s. While a little short of the claimed speed, this was still an outstanding performance, translates to 109.3x, and is almost three times faster than the already quick Verbatim. 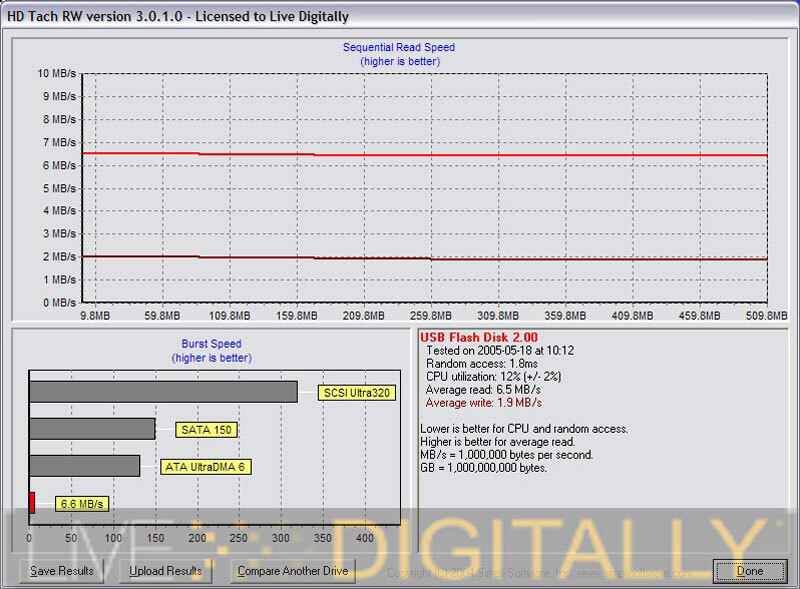 The random access time is a mere 1.7 ms, and the CPU utilization is 0%. These are, by a healthy margin, the fastest speeds I have seen on a removable USB flash drive, and on par (or faster) than many USB external hard drives out there. I doubt most users will notice the difference between 109x, and 160x. Also, note on the HD Tach that it was able to achieve this speedy performance along the entire drive; hard drives rarely seem to be able to do this. As with the Verbatim drive, “real world” writing performance was slower. I say “real world” because writing a number of smaller files is more difficult than writing a solitary large file, but when users transfer a folder of music or pictures, this is the far more common task. With the Lexar JumpDrive Lightning, I was able to write a 279 MB file consisting of 85 MP3s in a very quick 39 seconds. This calculates to 7.15 MB/s, or 47.4x in an optical drive equivalent. While short of the claimed speed of 18 MB/s, we should bear in mind that it is over 11 times faster than the Verbatim in actual usage across identical tasks. 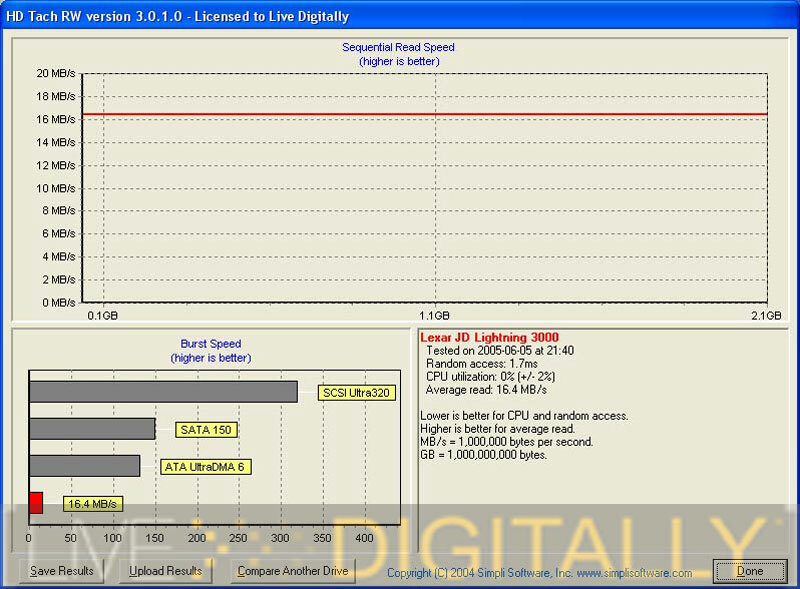 This Lexar drive sets a new speed standard for both reading and writing performance. In summary, the Lexar JumpDrive Lightning is a great product. Its timeless, elegant design, robust software package, and lightning speeds have earned it the “LD Approved” award. While the price of admission may keep some from owning it, the multiple standout features mean it’s worth saving up for. If I was an engineer at another company, this is the drive I would want to emulate when making our next flash based drive. Who should buy the Lexar JumpDrive Lightning? The executive who works between several computers, needs to bring sensitive, yet password protected data on the road, and wants some “Digital Chic” on his or her key ring. The college student who totes a lot of files with him or her would be the “big man on campus” with this drive on their keychain. The engraving area makes this a perfect graduation gift, and he or she will be the envy of all in the Rathskellar and computing lab. Like in so many areas of life, you need to assess your needs, and purchase accordingly. Just about everyone today needs one of these USB flash drives, unless you limit yourself to the simplest of tasks on one computer; all others will benefit from having this in their USB armamentarium. While the cost conscious may be content with a “plain jane” drive like the Verbatim, the Lexar, with its class leading feature set, deserves a very close look, and in the final analysis, some of your hard earned dollars. Special thanks to Lexar for supporting this review.